Na... simple they just use what aml did, dont change much... they add a few stuff here and there but 99% are still stock aml code! And of course aml dont do all the work for them! Anyway... i just booted 9 on it... dunno if i will rls it, since is a work(employer) rom... depends on their good mood lol! Also booted 9 on s905x! "T5 Max does have Root Access, unfortunately no Upper or Lower Bars"
can u elaborate on what you mean with "upper and lower bars"? further am i right in assuming that i will be aable to use sambadroid with this box since its rootable by default? what are the prospects of using regular android 8 or 9 with this Box in the future or should i rather get accustomed to the alice ui if i want to have a supported firmware that doesnt require much fiddling? You can try other launchers, Anything is possible, updates can happen when they do, also there is some custom roms for other 905x2 that may work. The launcher is OK, just not one of my favs. can you suggest a source of information where i can get an overview of the options that i have and how to install them? Not for the faint hearted type lots to read. the most important thing for me is to use my external usb3 hdd and watch my (legit) uhd bluray isos from it + share the external drive in lan via sambadroid. netflix is not important i can use the app thats installed directly on the tv. one last question, why is it that all s905x2 boxes have android but not android TV as os? will there be ATV boxes with this chip in the future? Normal Android for user to fiddle so to speak.
" i think you will find MI Box, Shield etc etc"
Do you think there will be amlogic s905x2 versions of those boxes? Last edited by boxz0rd; 02-04-2019, 04:01. Is auto frame rate switching working with kodi in this box? Would anyone be able to help confirm a problem I am having with the TX5 Pro please. Using some popular media programs that have the "hamburger" menu in the top left corner, I cannot access that hamburger menu using the typical DPad Up, (or keyboard UP arrow). Of course a mouse works to click on it. I'm only experiencing this problem on this new Tanix box, but on multiple different media programs. I have the ΤΧ3 ΜΑΧ and the root switch work pretty well. Does the TX5 MAX have this ? Hi! I need some guidance. I tried to flash the latest firmware with Amlogic Burning Tool but with no luck. Everytime it stucks at 3% "Downloadin UBOOT". I cant find any reset button on the box anywhere! The only way for Burning tool to recognise the device is by plugin the same time the usb cable and the power cable on the box. Am I doing something wrong? Can I flash the ROM by using Burning SD Card tool? Thanx in advance! EDIT: For whom may concern. The Burning SD card tool works. I managed to flash latest firmware, all good. Last edited by pkatsaras; 02-17-2019, 10:31. Been looking around for my first Androir box for the last month. Will be mostly streaming movies and sports. Down to Tx5 Max or X99. What I like from the Tanix Tx5 Max: Specs, Alice, Root, Gigabit Ethernet, DDR4, Front display (time), S905X2, Digital Audio Out (need that), Oreo, Price. What I like about X99: Specs/Power, Remote/Mouse, Digital out, Giga Ethernet, Front display, New firmware (although I don't know what are the changes). Any advice, suggestions or warnings are appreciated. Isn't it strange that the TX5 Max doesn't show up in the Tanix homepage? 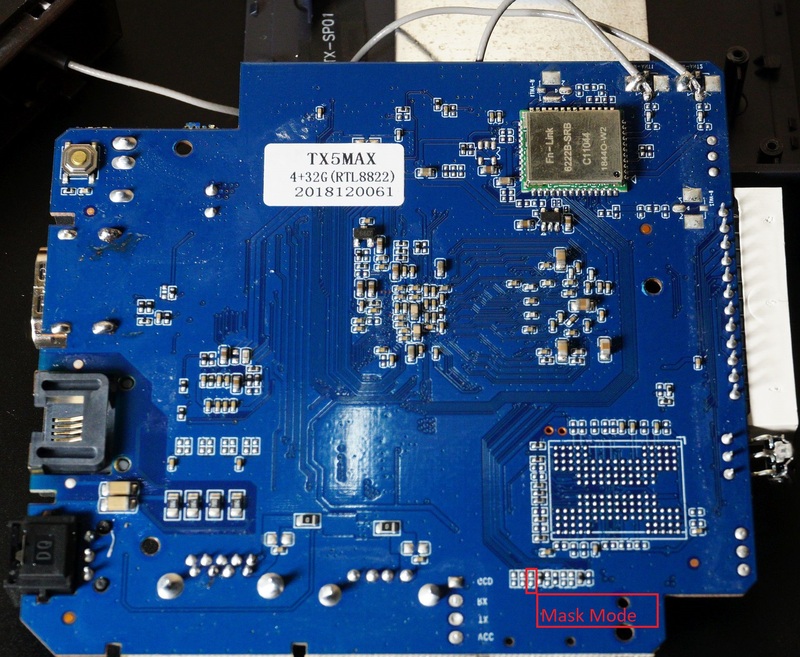 Also the TX5 Max has a fn-link 6222B-SRB wifi chip, while other s905x2 have an AP6255. Does anyone know of another s905x2 box that has the fn-link 6222B wifi chip? Although i feel The TX5 Max is a awesome machine, i really don't like NOT having the navigation and status bar. And there is definitely some work going on the background. I've searched high and low, still can't find a stock android ROM for it. Isn't anything out there yet? All times are GMT-8. This page was generated at 14:26.